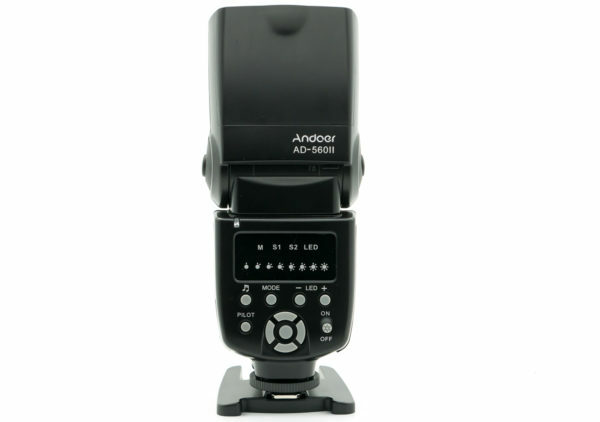 The Andoer AD-560II is a cheap manual flash unit with a built-in LED lamp. Is it any good? Flash manufacturers this year have been trying to cram innovative new features, such as lithium batteries and integrated radio, into their high-end devices. The Andoer AD-560II is at the opposite end of the spectrum, sporting a minimal feature set at a low price. This manual-power, shoe-mount flash was sent to us by the Andoer Official store. It is a budget option, priced £37.98, and currently 20% off (£30.38) with voucher code C2X3I9GR. You won’t find TTL, built-in radio or lithium batteries in this flash. In fact, the AD-560II doesn’t even have a screen. Instead, it has an LED ‘idiot light’-style control panel on the back. Other notable features are the LED lamp on the front, a built-in optical slave sensor and support for external battery packs. It seems to be aimed at the photography enthusiast looking for a cheap off-camera flash, who perhaps dabbles occasionally in video. The user manual lets slip that the Andoer AD-560II is really a rebranded Wansen WS-560(II), which is itself a clone of the Yongnuo YN560 with an added LED lamp. Therefore this is not a new flash to the market and you might be able to find it cheaper under alternative brands. Build quality is perfectly fine. It is all plastic, of course, but feels sturdy. The hotshoe foot is made of metal and the battery door has a fairly robust sliding mechanism. The power switch and buttons are hard plastic and have a good tactile response. 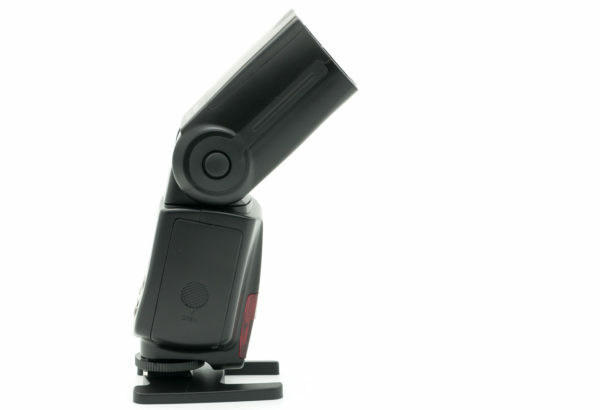 The flip-out diffuser is no flimsier than on any other flash. The head swivels 180° to the left and 90° to the right, with friction stops every 30°. It tilts 90° up and 7° down, with friction stops at 90°, 75°, 60°, 45°, 0° and −7°. There are buttons on the side implying it can lock into place, but actually they don’t do anything, so this flash is not one suitable for heavy head-mounted accessories. Mechanically, the only other weakness is the hotshoe foot, for which the locking ring is too small and the sprung locking pin protudes enough to obstruct sliding into a hotshoe, even when unlocked. This makes mounting the flash fiddly, but is not really a deal-breaker. This flash is very poorly designed. It has the features promised, but almost everything is implemented in a clunky way that makes the unit frustrating to use. Andoer/Wansen’s engineers have apparently produced a cargo-cult copy of the original Yongnuo YN560, without quite understanding what made that flash popular. 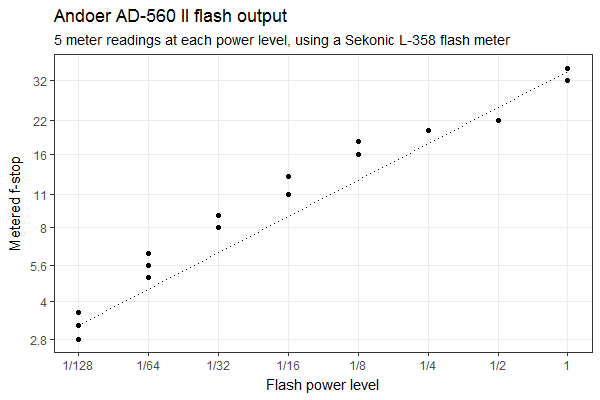 Like the YN560, the Andoer AD-560II shows the currently selected flash power level using so-called ‘idiot lights’. From left to right, the eight indicator LEDs correspond to 1/128, 1/64, 1/32, 1/16, 1/8, 1/4, 1/2 and full power. That’s the idea, anyway, but on the AD-560II the LEDs are feeble and indistinct, making the current power level unclear in dim light and unreadable in daylight. See for yourself in the two photographs below. Can you see immediately that the flash was set to manual (M) mode at 1/8 power? How did anybody let this onto the open market? Fortunately, the poor design of the control panel is mitigated by the simplicity of the feature set. There are not too many modes or menus to bamboozle you, though not everything is obvious either. There are four operating modes: M, S1, S2 and LED. The right and left buttons adjust the flash power, increasing and decreasing respectively by one stop at a time. Once you reach minimum power or maximum power, it stays there rather than going beyond and looping round to the opposite end of the scale. 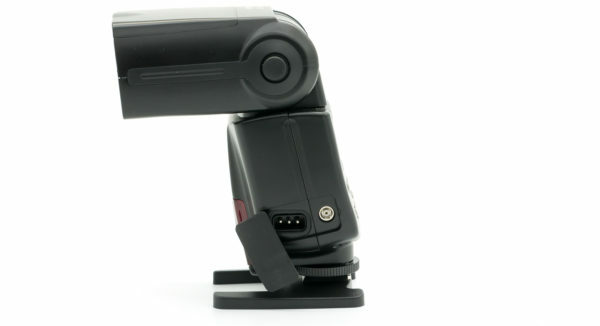 Given that the buttons have a good tactile response, this flash works quite well for chimping, as you can increase and decrease the power by a stop at a time without looking. The flash head is not too stiff to rotate easily, so you can use this on-camera for events and impromptu portraits fairly easily without much experience. Here is a bounce-flash portrait of Flapjack the dog. I also used the flash to cover a wedding and didn’t find it restrictive, except for the lack of zoom. The up and down buttons allow “fine tuning”, which appears similar to a feature offered on the Yongnuo YN560, except Andoer’s implementation is effectively undocumented. According to the instruction manual, fine-tuning is in “0.3 EV” and “0.2 EV” steps. You know you are in fine-tuning mode because the red indicator LEDs blink. It is a complete mystery to me what each fine-tuning level actually represents. Whereas the Yongnuo YN560 offers −3/8EV to +1/2EV adjustment in 1/8EV increments (and this is clearly described in that flash’s manual), the Andoer manual says each power level has four levels of fine-tuning. But there are eight LEDs, so presumably half of the settings in fine-tuning mode are redundant. It is hard to call something “fine-tuning” when you actually have no idea what level of precision or range of values is on offer. I decided to find out for myself. At 1/8 power, I measured each of the eight fine-tuning levels five times, at a range of 1 foot with a Sekonic L-358 light meter. Every single level was equal to f/57. In other words, fine-tuning doesn’t work, or varies the power so infinitesimally that the differences cannot be detected with a mid-range incident light meter. At least this shows the AD-560II’s output is consistent — albeit when it isn’t supposed to be! Herein I will just assume fine-tuning doesn’t exist. Between modes, the controls are also gloriously inconsistent. Though M, S1 and S2 flash modes work in pretty much the same way, the LED mode is another instance of poor design. In LED mode, you can adjust the power of the front-facing LED lamp. In this mode the up, down, left and right buttons don’t do anything; you increase and decrease the power with the LED +/− buttons. There are seven LED brightness settings (the lowest setting is ‘off’). When you switch back to M, S1 or S2 modes you can toggle the LED on and off with the LED + and − buttons. So you can use the LED light and the flash at the same time, which is handy if you want an AF-assist lamp or low-level fill lighting. This also means that LED mode is almost entirely redundant: a better design would have one fewer mode and allow the LED +/− buttons to adjust the lamp power in M, S1 and S2 modes. I don’t shoot a lot of video, so haven’t really put the LED through its paces, but usage is reasonably straightforward. The LED stays on for as long as you like, though it will turn off every time you switch from LED mode to M mode, so you have to turn it on again with the + button. This is illogical, given that the LED doesn’t turn on when you enter LED mode. There is no zoom setting on the Andoer AD-560II, which is disappointing because it limits the light’s flexibility both on and off-camera. 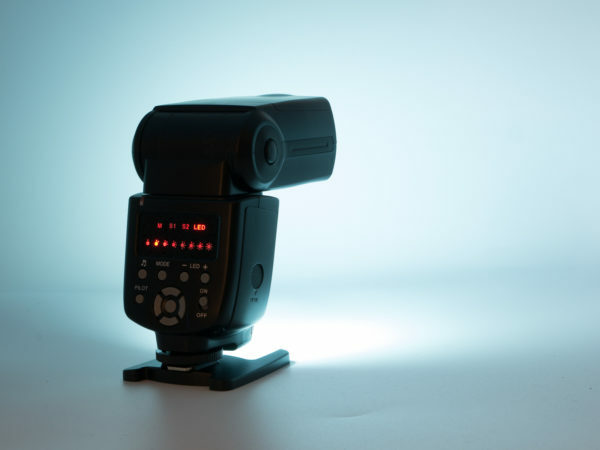 On-camera, changing the beam angle helps match the focal length of your lens efficiently, while off-camera or when bouncing the flash we can use wider beams to fill light modifiers and bounce off walls and narrower beams to control spill light. From test shots, the fixed focal length of the AD-560II appears to be around 35mm equivalent. The projected light is pleasant and has smooth falloff, so you can use this as a background light or for shooting flat objects without worry. See below. On the other hand, you will be losing light outside the frame if you use this as a direct light with telephoto lenses. 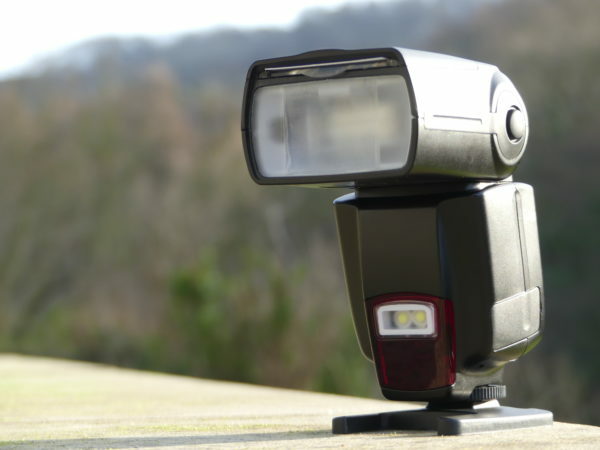 So paparazzi and wildlife photographers probably won’t get much out of this flash. Andoer claims a recycle time of 3 seconds at full power. I counted about 2.5 seconds at with fresh Duracell Plus Power AA batteries (1.5V alkaline). This should be even quicker with a CP-E4-style external battery pack, but I didn’t have one to hand to try it. The ready beep can be disabled, but the flash forgets this when powered down, so every time you turn the flash on again, the beep is enabled. Sometimes rather than just beeping once, it plays a little musical tune for a second, which I can only attribute to a dodgy connection or some other fault in the circuitry. Is the flash power control accurate and consistent? Using an incident light meter, I measured the brightness at each of the eight power settings. The following graph shows my readings. Both axes are on a logarithmic scale. If the power settings are accurate then the readings should form a straight line from 1/128 to 1/1. The actual measurements suggest not every power level is exactly one stop apart: 1/128 to 1/64 is slightly more than a stop and there is only about one stop difference between 1/2 power and 1/8 power. 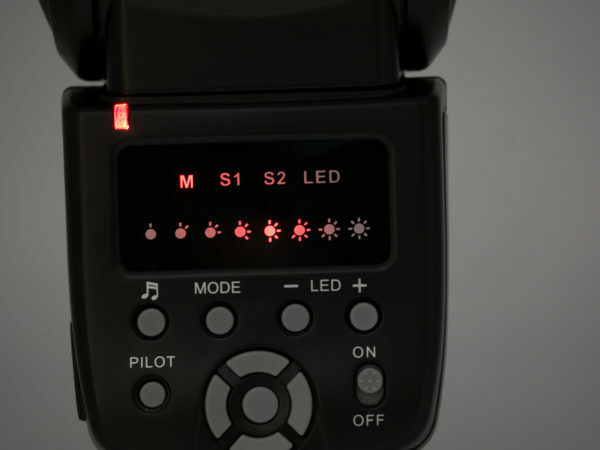 So the power settings may be slightly off and you should use chimping or a light meter to get the right exposure rather than the theoretical increase or decrease in brightness between power levels. I noticed once that the LED flickers briefly when on for a long time. 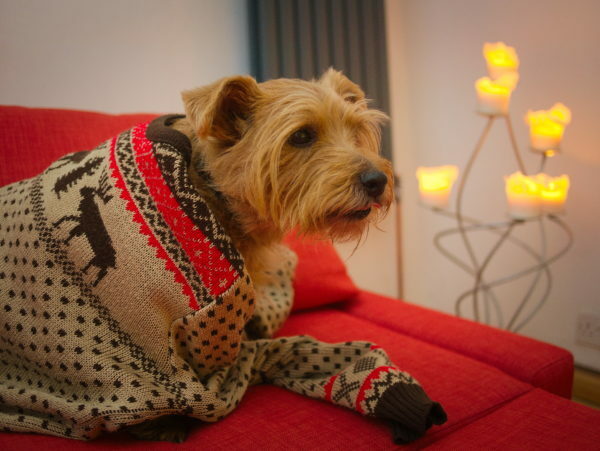 It gets slightly warm with continuous use but not hot. However on the whole the power level seems reasonably consistent. It isn’t bright enough to shoot a whole video with except in really dim conditions, but should be OK as an autofocus-assist lamp or a vague modelling lamp for off-camera shooting.  Though it seems like a nice flash on paper, in practice the AD-560II leaves something to be desired. 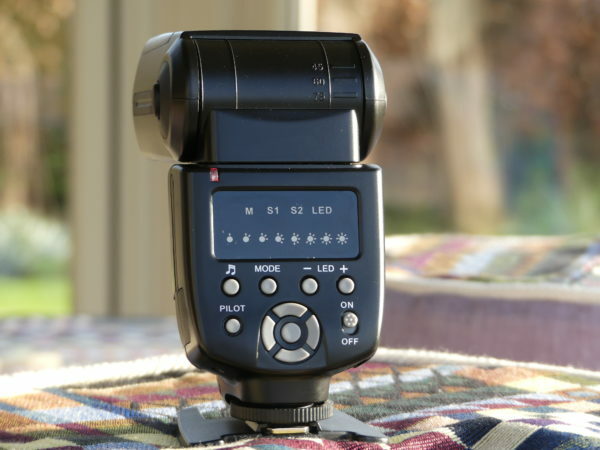 It is one of the cheapest flashes around with full manual control, but the poorly designed controls, lack of zoom and possibly inaccurate output don’t seem like good compromises to make to get a low price and an LED lamp. If you really want an LED lamp on your flash, you might be better off strapping one on, though the AD-560II will be a cheaper and neater option if you don’t already own several flashes. There are other flashes available with integrated LED lamps but all the options I have seen are much more expensive. 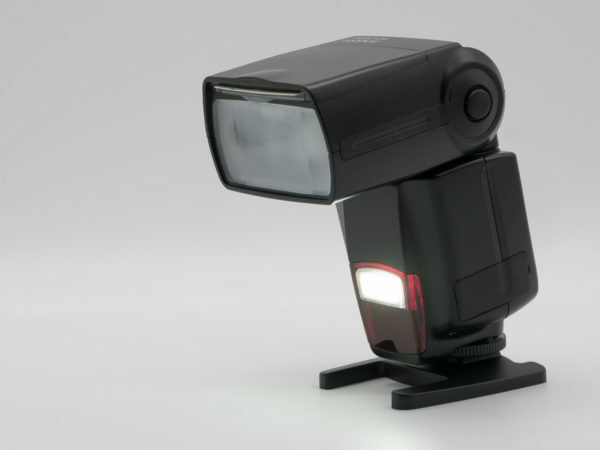 If you are not too bothered about the LED lamp, other budget manual flash options include the Yongnuo YN560-IV at £56 (with earlier versions available slightly cheaper), the Godox/Neewer TT660 for £31 and the Triopo TR960 II priced £30. As an additional flash for use as a background light, hair light or fill light, the AD-560II actually works reasonably well. If you were shooting behind-the-scenes videos or video tutorials, the little LED lamp would be a valuable modelling aid. But for your first flash or one you intend to use as a main light on-camera, you might want to consider the competition carefully first. The Andoer AD-560II is available from the Andoer official store for £37.98, or £30.38 when you use discount code C2X3I9GR. Thanks to Andoer for providing us with the flash used in this review. Visit their official Amazon.co.uk store or Andoer.com for more information.